H. Rick Bamman - hbamman@shawmedia.com The Harvard Police officers Ed Kohn (from left) Verle Leard (cq) and Tyson Bauman ponder the grow th of their beards. The officers are participating in No Shave November and will be carrying their beards into the month of December for Shop With a Cop. 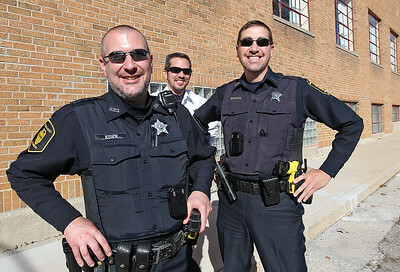 H. Rick Bamman - hbamman@shawmedia.com The Harvard Police officers Tyson Bauman and Verle Leard are reflected in Ed Kohn's glasses. The officers are participating in No Shave November and will be carrying their beards into the month of December for Shop With a Cop. This year patrons can donate to an individual officer towards growing their beards, and the officer with the highest donation will present the check to the McHenry County Police Charities. H. Rick Bamman - hbamman@shawmedia.com The Harvard Police officers Ed Kohn (from left), Tyson Bauman Verle Leard are participating in No Shave November and will be carrying their beards into the month of December for Shop With a Cop. This year patrons can donate to an individual officer towards growing their beards, and the officer with the highest donation will present the check to the McHenry County Police Charities. 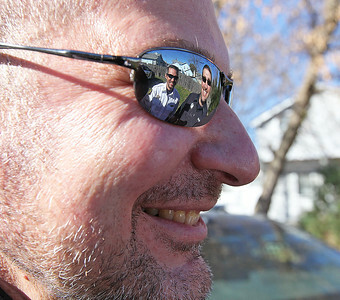 The Harvard Police officers Tyson Bauman and Verle Leard are reflected in Ed Kohn's glasses. The officers are participating in No Shave November and will be carrying their beards into the month of December for Shop With a Cop. This year patrons can donate to an individual officer towards growing their beards, and the officer with the highest donation will present the check to the McHenry County Police Charities.